Positive Mental Training has been found to be effective in primary care. Research with Edinburgh University in 2004/2005 established Positive Mental Training’s efficacy in depression in primary care. In this study the programme was initiated by a nurse, after referral from a GP, and followed up with telephone contact only. this effect was similar to other psychotherapeutic treatments – counselling and CBT. 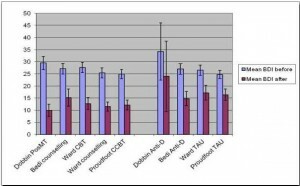 Net benefits of CCBT and PosMT were approximately equal in individuals with ‘moderate’ depression at baseline and markedly in favour of PosMT for the ‘severe’ depression subgroup. PosMT may represent good value for money in treatment of depression for certain groups of patients. We have carried out anonymous surveys of professionals using the programme which show that Positive Mental Training has a positive effect on practitioners – in increasing their mental health knowledge and ability to feel they are coping better with not only their mental health patients, but with wider aspects of their work. Survey & Activity Report of Positive Mental Training for Manchester GPSTs 2016. 210 patients downloaded the programme from the website over the last 12 months, and 61 from the Feeling Good app from January onwards. Total 271: average is 13 patients per doctor using the programme. Links to 2 earlier surveys are below, which show similar benefits. A 6 month pre & post survey of health professionals who attended the RCGP accredited training workshop ‘Positive Mental Training: recovery from distress’ in Wales, with results showing increased wellbeing as measured by WEMWBS. We have used these surveys to help us estimate the number of patients treated with Positive Mental Training, which we calculate to be over 70,000. How do we calculate numbers of patients treated to be over 70,000.